Set up redundant DNS infrastructures in the cloud. Great choice also for infrastructure backup purposes. DNS Manager Cloud OnDemand is used by service providers and businesses to host mission critical DNS information. As the DNS service uptime depends also on the physical location of the DNS servers, the Cloud service is often used to increase the reliability of existing DNS infrastructures. It takes less than five minutes to have your DNS Manager Cloud OnDemand ready! By deploying Cloud OnDemand in different 4PSA Cloud locations, you set up a redundant DNS infrastructure. Our SLA guarantees 99.9% availability for your private Cloud instance. 4PSA delivers everything you need to deploy your DNS infrastructure, you just manage it! DNS Manager Cloud OnDemand integrates with your existing hosting infrastructure that might already include other DNS servers. It can be used to centralize DNS from multiple hosting servers or for redundancy purposes. From easy integration to flawless replication, find out how DNS Manager Cloud OnDemand simplifies your business. 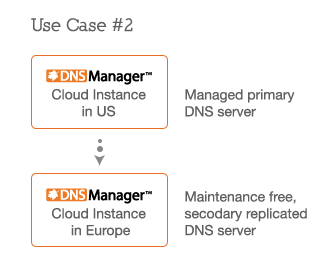 DNS information is replicated from hosting servers to the DNS infrastructure using the DNS Manager web services based protocol. Adding new DNS sources to the infrastructure is a two-minute process. The DNS infrastructure can be easily managed from the web interface. If necessary, DNS management can be also delegated to customers. DNS provisioning operations can be automated, because the web services based API can be called from your operations automation software. If you use hosting control panels such as Plesk, Cpanel, Helm, HSphere, Interworx or even standard BIND based DNS servers, you can easily export the DNS information to the DNS Manager Cloud OnDemand. Your Cloud OnDemand instance is completely isolated. You can manage the DNS Manager server and customize it to perfectly meet your business needs. Get 4PSA quality support as part of the deal. While it is your job to manage your instance, we will provide free software updates and assistance.